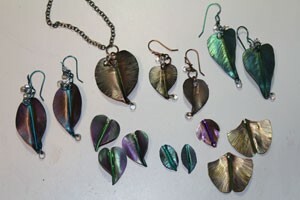 Learn to cut niobium sheet with metal shears, bend, texture it and then colorfully anodize your created pieces. Add beads with wire and jump rings to suggest falling rain. Students will learn how to cut, drill, shape, file, and sand niobium sheet and wire; some fold forming techniques; anodizing techniques.